If you're a nature lover, this place is a must see! A place of great beauty, Khao Sok National Park is one of the world's ancient rainforests. This region has a wide variety of gibbons, leaf monkeys, and exotic plants. No wonder, why this is a Sanctuary for Asian Elephants. Upon arriving at the camp, we were treated to traditional Thai cuisine, followed by a dip in their outdoor pool. This place takes glamping to a whole new level. Comfortable bed & linen, hot running shower, western style toilets and acres of wildlife to discover. I got the chance to wash and feed elephants under an expert guide and the resident mahouts (each elephant is assigned a caretaker). 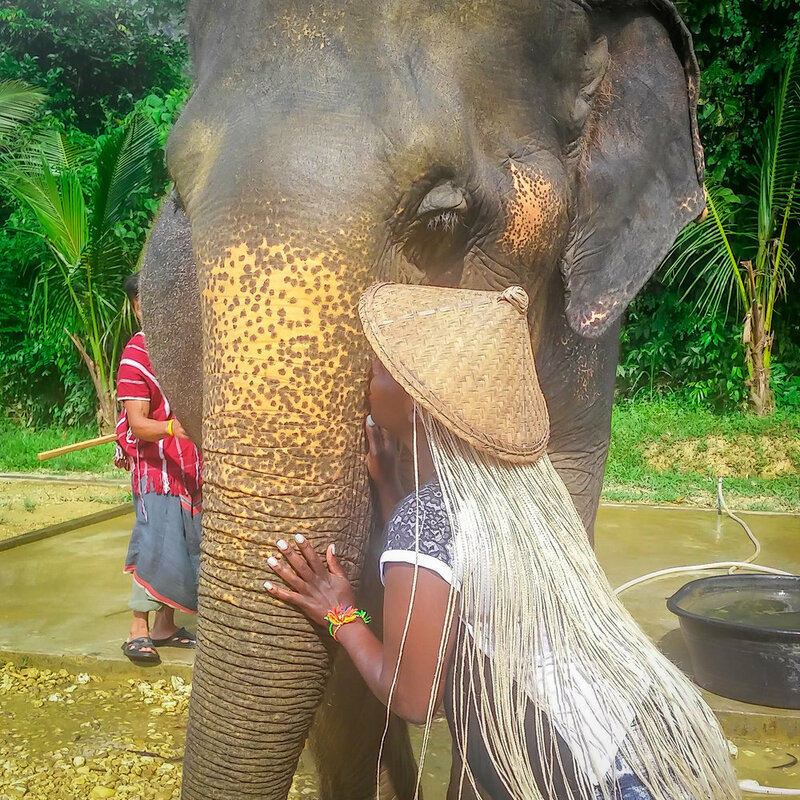 I loved seeing how well these animals were cared for (elephant riding is not allowed). I spent the remainder of the afternoon kayaking through the nearby artificial lake of Cheow Lan, also known as Ratchaprapha Dam, where I was able to see these regions majestic limestone mountains. In the evening, a local group of school children greeted us. They were so kind, and we later found out that the camp sponsors them. The highlight of the evening was when they performed a traditional Thai dance. The next day, we jetted down Cheow Lan Lake, to head to the floating tent camps. These camps were pretty cool. I've never seen anything like this before; they were floating on water. Amazing! Each tent came with two kayaks. This place offers fun outdoor activities, kayaking on the lake and hiking through the jungle in search of deep caves. That part was cool, I got to see bats up close and personal for the very first time, and I'm pretty sure a bug or two went into my mouth. There is a short video clip of this on my Instagram page if you're looking for a good laugh!